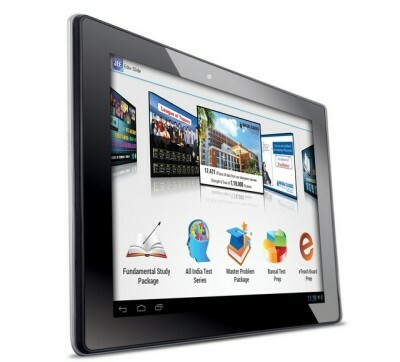 iBall launched a new Quad core tablet named as iBall Edu Slide 3G Q1035 . This tablet is specially made and designed for the IIT and JEE students. The tablets comes with pre loaded Bansal Classes Content, Educational apps that will help the student during the preparation for JEE and IIT examination. It would compete with recently launched Xolo QC800 and Swipe MTV Slate. Talking about the features and specifications it comes with 1.2GHZ Quad core Cortex A7 processor integrated with 1GB DDR3 RAM. It has 10.1-inch (11280×800 pixels resolution ) IPS HD display,8GB buit in storage. The iBall Q1305 Runs on Android 4.2 jelly bean OS. The EDU-slide Q1035 comes with 8MP auto-focus rear camera with LED flash and a font facing camera with video call support. It is capable of making vice and video calls, as the tablet has Dual SIM support with Dual Standby time. The 3G-Q1035 tablet features 3G, WIFI, Bluetooth, GPS, FM radio, Wireless Display and Daydream, micro HDMI port and micro USB port with OTG support. The iBall Q1035 is priced at RS 36,999 and it comes with 1year of warranty.